In the world of Star Trek collecting, pieces from The Original Series are considered the Holy Grails of the hobby. I'm thrilled to have these from the classic that started it all. First comes an amazing Klingon Disruptor, the main sidearm for Star Trek's most enduring bad guys. The piece shows some wear and tear but that just makes it cooler. My two TOS tunics aren't from the original production, but they are production-made pieces, created for the aborted television revival in the 70's, "Star Trek: Phase II". 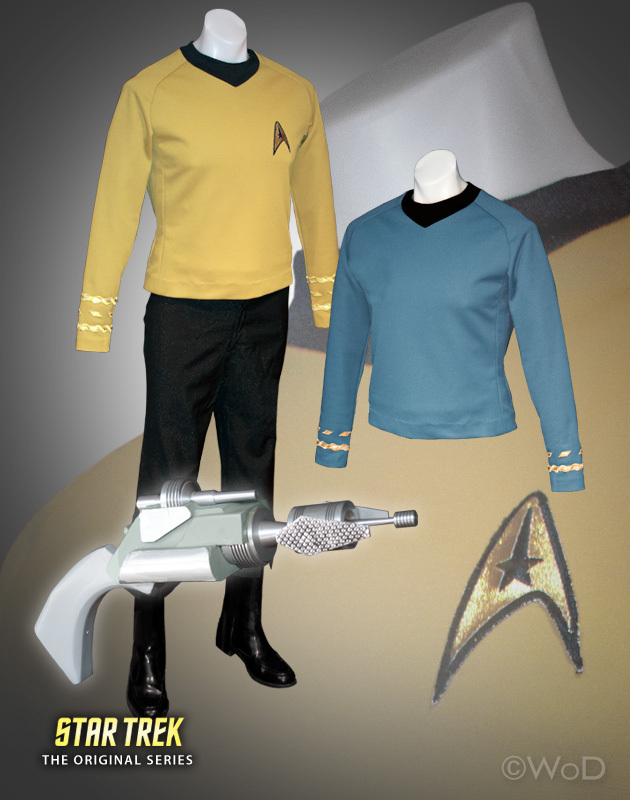 The blue was made for DeForest Kelley in his role as ship's surgeon Leonard "Bones" McCoy. Because of the size of gold tunic, I surmise it was made for Sulu actor George Takei, but that is simply an educated guess. The Captain's rank bands are not original to the shirt. The pants were used throughout the original production and worn by stuntman Paul Baxley who was one of William Shatner's stunt doubles. He can clearly be seen playing Kirk in a number of fight scenes (like "Amok Time"). They show numerous repairs and the name "Baxley". © 2015 NEOWORX – All Rights Reserved. STAR TREK TM & © 2015 CBS Studios / 2015 Paramount Pictures – All Rights Reserved.